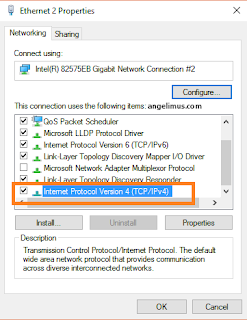 What is the fastest DNS for your internet connection? 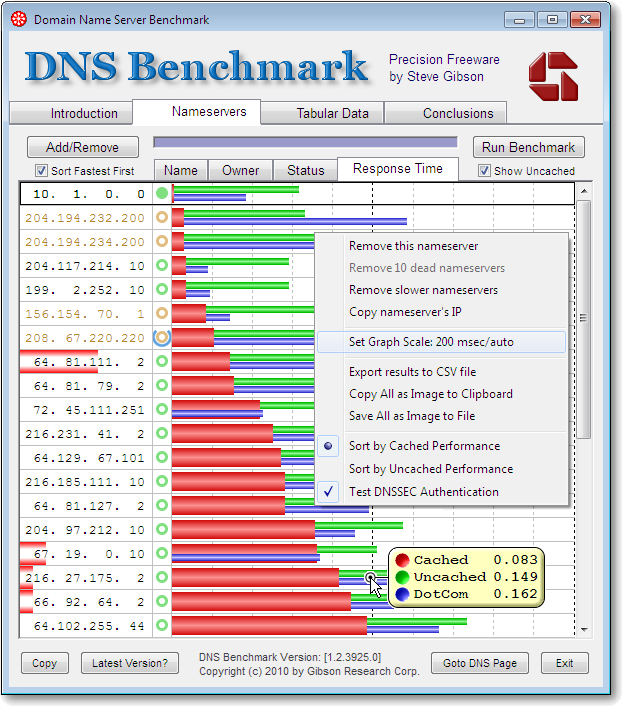 the result may vary from diffrent user, why dont you find out by yourself by benchmark it, i found some good tools for benchmarking DNS, to show which is the fast DNS that suitable for my internet connection, and there are many result for it. Steve Gibson the creator build some cool utilities for it, you can check it by yourself in https://www.grc.com/dns/benchmark.htm, or you can download the link below. 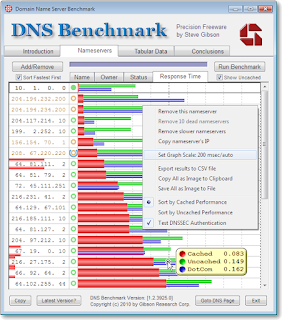 This is simple tools for find suitable DNS for you, just click on Nameservers tab, and click Run Benchmark, just sit and relax for a while, the apps will show you the result of fastest DNS for your internet connection. This DNS application has large of database for list DNS that available, and many of them are from famous provider in the world and free to use, just right click on the DNS IP which is the fastest from the list, and select Copy Nameserver's IP. 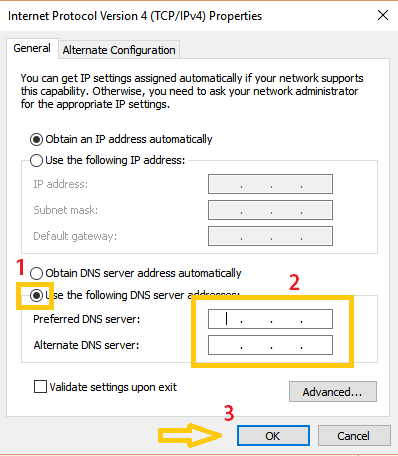 Select "Use the following DNS Server Address"
and Click OK, and OK again. Feel the diffrent, your internet will go faster than before. HI, just want to say hello to all my fellow, i want to apologize to all reader that disappointed because my absence for a very long time in tutorial world, especially in CentOS, i have busy lately until now, but sometimes i had some free time for relax, because of daily routine and activity. i will read your request of sugestion or critics or anything, including spam :D, and i will response it as fast as i can. Special yearly VPS Offer with high power and lot of RAM. Using E5 Dual Processors with lots of cores 64GB Ram minimum to each Node, using SSD & Sata3 New disk drives. We use the latest technology from OVH to produce stable and reliable fast powerful hosting to meet your needs! Budget Dedicated Server offer from HEXODO. Established in 2013, HEXODO is becoming one of the most reliable hosting providers nationwide. With our main data center in Rotterdam, the Netherlands, HEXODO was built from the ground up by engineers with a vision of delivering a fully integrated, trusted hosting service. At HEXODO, our offerings are simple and exactly to the point. Whether you need a server to backup your data or a place to host your full IT infrastructure, HEXODO has earned a reputation for its unparalleled customer support whenever and wherever our clients need it. Cheap dedicated server from Delimiter.com, only $5 monthly, limited stock only. For the first time you can get your own dedicated server for the SAME price as a virtual server. Delimiter's Dedicated Servers are not short on specifications either - Atom 230, 2GB RAM, 100GB ISCSI Disk - all yours to power your applications, run your own virtual servers or even run a private game server. Unlike virtual servers, no-one else is sharing the server so 100% of the resources are yours to use 24 hours a day. Cheap and Powerfull VPS with KVM Virtualization and 1 Gbps uplink, with 50% Discount for first month, don't miss it. VPSLAND.com is the industry leader in providing scalable, highly-available, redundant, self-healing VPS Hosting. We are one of the first VPS providers in the world to offer both Enterprise Grade Linux VPS Hosting and Windows VPS Hosting. Our VPS hosting solutions provide powerful, yet easy to use Virtual Private Server (VPS) environments for individuals and businesses of any size! Promo VPS with high discount, 60% discount recurring, so don't wait until out of stock. From shared hosting, to cloud servers, to dedicated servers, we are able to help you grow as your business grows. All of our cloud servers run on optimized, speedy hardware RAID10 servers with caching. Enjoy the quickness of SSD drives on our shared hosting. Enjoy a support team that cares. We want to help you get your website up and running in the most efficient way possible. * Before you buy this VPS Special offer, i suggest you to create ticket first, to ask about VPS package. 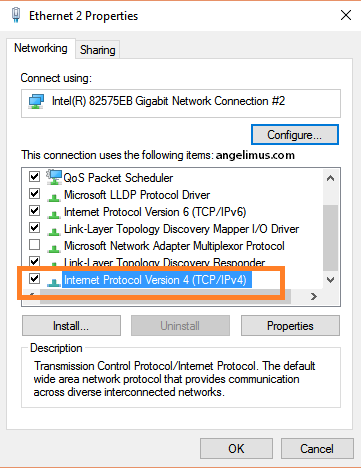 VPS can't connect to Internet "Unknown Host"